On Sunday Grand Slam Champions Kim Clijsters and Svetlana Kuznetsova faced off at Madison Square Garden in a match of Jumbo-sized proportions! 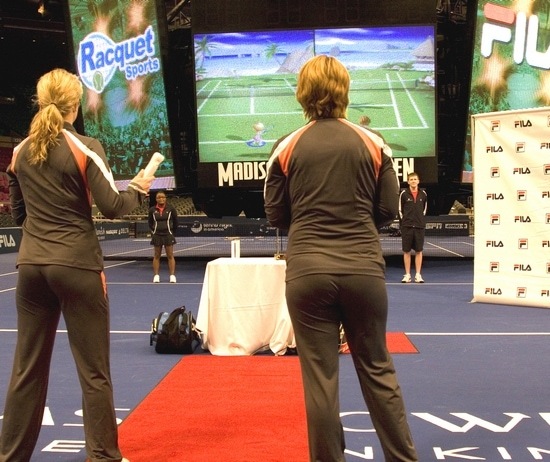 I was invited to watch the pair compete in a heated tennis match in Ubisoft’s, Racquet Sports game on Nintendo Wii which was broadcast on Madison Square Garden’s Gardenvision. This was a special event in which fifty children from the Garden of Dreams Foundation were front and center to watch the “Match before the Match,” complete with a photo opp and meet and greet session with these two champions. The match was streamed live on Fila’s Ustream channel and on www.fila.com. The stars began the match with a sense of humor and ended with Clijsters having the bragging rights as Racquet Sports for Wii Champion. Kim won the best two out of three games. Clijsters and Kuznetsova also debuted Fila’s new Spring 2010 Center Court Collection which they will wear in competition on Monday night at the BNP Paribas Showdown for the Billie Jean King Cup at Madison Square Garden. Kim and Svetlana are the first Fila athletes to wear Center Court which has a white and ebony color palette highlighted by bright youthful accents. The Center Court Collection is available at specialty stores nationwide and on www.fila.com . Wow ………. I am so much interested in the Racquet sports which include many of the games but i am a player of Tennis…… I like tennis so much and other racquet games..